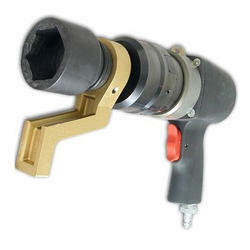 Our company offers exclusively designed array of PG/PT - Pneumatic Torque Wrenches. These products are offered to the clients along with filter, regulator and lubricator. Other accessory that is provided with these products are reaction foot. We offer heavy duty pneumatic torque wrench, which are especially designed for accuracy and excellent repeatability and at the same time it is the very useful tool for use at Hazardous area like Oil & Gas industries. And this is one feature that makes the tool operator’s job very easy, substantially enhancing the overall efficiency. Kindly find the PDF for more information. Tristar Industrial Tools Pvt. Ltd.
Features> Torque precision and precise loosening from 100 up to 13000nm. > Pneumatic torque control together with a robust, powerful pneumatic motor provide precise, economic work from only 2 bar operating pressure. 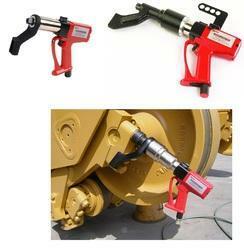 The Pneumatic Torque Wrench is an additional alternative in high level torque bolting technology. In conjunction with the LÖSOMAT air control unit, this torque wrench produces continuously high performance and precision in bolting applications. The ergonomic, 360°-rotating pistol grip with easy right-left changeover, makes it extremely convenient to use. 1800 RPM, DUAL SPEED, PNEUMATIC TORQUE TOOL. Square Drive: 1/2" / 3/4"